Without Ralph McQuarrie there probably would be no "Star Wars." And if there were a "Star Wars" without him, it wouldn't look like the "Star Wars" we know. McQuarrie, an illustrator and conceptual artist, painted the first visual depictions of George Lucas' galaxy of long, long ago and far, far away. When Lucas sought studio backing for "Star Wars," he used McQuarrie's paintings to sell skeptical movie executives on the film. And when Lucas couldn't describe to his production designers and special effects technicians what he wanted, he let McQuarrie's illustrations do the talking. "When words could not convey my ideas," Lucas said, "I could always point to one of Ralph's fabulous illustrations and say, 'Do it like this.' "
McQuarrie died Saturday at his home in Berkeley, Calif. He was 82. Soon after news of his death broke, the first tributes appeared on YouTube — sideshows of his paintings synchronized to selections from John Williams' "Star Wars" score, each one as good a reason to skirt copyright as any. It was McQuarrie who designed the iconic look of Darth Vader, modeling Vader's helmet on those worn by samurai. And before any footage was shot, he had visualized the climactic attack on the Death Star. Looking back at McQuarrie's earliest illustrations for "Star Wars," it's striking how similar they are to the finished film — and yet how different. There's a strangeness to some of those paintings. Maybe it's how C-3PO looks a lot like the robot from "Metropolis." And in the very earliest sketches, you get hints of a "Star Wars" that never was, a "Star Wars" Lucas still called "The Adventures of Luke Starkiller." Others are reminiscent of the NASA concept art you used to find in books published in the 1960s and '70s, when it seemed like a future with daily space flights to huge spinning wheels in the sky was just around the corner. The similarity isn't accidental. Before he helped Lucas envision "Star Wars," McQuarrie was an aerospace illustrator for Boeing and an animator for CBS News' Apollo coverage. McQuarrie's paintings gave "Star Wars" fans their first peek behind the scenes of the space saga. The illustrations appeared in some of the first official "Star Wars" magazines and were mixed in as inserts in packs of the first "Star Wars" trading cards. To young fans back in 1977, it was a strange, new side of "Star Wars" we hadn't seen in theaters. There is real power in McQuarrie's art. A painting for "The Empire Strikes Back" depicting Luke Skywalker running from his crashed snow speeder with an Imperial walker closing in the background manages to be just as menacing as anything in the movie itself. 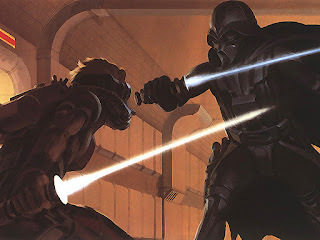 McQuarrie worked on the original "Star Wars" trilogy as well as related projects like "Shadows of the Empire." But by the time Lucas was ready to make the prequel trilogy, McQuarrie was ready to bow out. And maybe that's just as well, considering how the prequels turned out. Even he couldn't have saved them. Besides "Star Wars," McQuarrie contributed to the original "Battlestar Galactica" and films like "E.T.," "Close Encounters of the Third Kind" and "Raiders of the Lost Ark." He designed a new USS Enterprise for the proposed "Star Trek: Phase II" TV series. And he won an Oscar for the special effects in "Cocoon." We may never be sure what the future will look like, but we know what it's supposed to look like. It's supposed to look a lot like a Ralph McQuarrie painting.